Is the Old Testament essential to understanding Bible prophecy? Dr. Reagan: Let me read you the verse 1 Corinthians 13:12, "Now we see in a mirror dimly, but then face to face," That means when we stand face to face with Jesus. "Now I know in part, but then I shall know fully just as I also have been fully known." This says that we only understand in part for now, but when we stand in the presence of Jesus Christ we are going to understand it all. But, what if you could ask Jesus a question right now about Bible prophecy? What question would you ask today? Gary Fisher: I would want to know the exact chronology of how all of Bible prophecy is going to work out that is remaining to be accomplished. Like, is Psalm 83 going to occur before Ezekiel 38? Is Ezekiel 38 going to be before the Tribulation? I would want to know in detail how it's going to work out. Maybe also a chart, one I don't have to correct. Dennis Pollock: I would want to know just what are we going to be doing in Heaven? The prophecies which talk about Heaven just give us little glimpses, but they don't tell us much at all. I have an eagerness to know just what Heaven will really be like. Dr. Reagan: Yes, the Bible provides a great detail about the Millennium and what we will be doing, but when it comes to Heaven there are mainly two things which stand out in my mind: one, we will see the face of God which means we will have intimate fellowship with God, and two, we will serve Him. There are certainly going to be things to do. Dennis Pollock: Right! The one thing that a lot of people think that I don't believe is that we will be singing 24/7. I mean, I enjoy worshipping and singing, but hour after hour, and day after day, and year after year for all of the millennia — oh, no! Dr. Reagan: No, no, no. But, I tell you, what I can hardly wait to be in is a worship service led by King David because he was kind of an "uninhibited" person. Dennis Pollock: That's right. I think we will be as well, if we're not already. Dr. Reagan: I think my question would be, "Who in the world are those peoples who seem to be living outside the eternal Jerusalem on the New Earth?" There seems to be people living outside during the eternal state. Who are they? Where did they come from? What is the deal about that? I've never been able to quite figure that one out. I have a long list of questions not only about Bible prophecy, but other things as well. Certainly there will be ones concerning Bible prophecy. 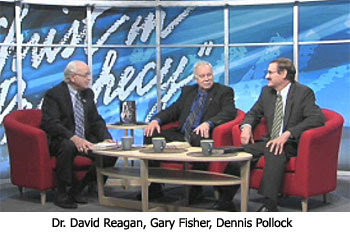 Dr. Reagan: Why is a knowledge of the Old Testament essential to understanding Bible prophecy? Dennis Pollock: You know, Dave, when I started working with you one of the things that you insisted on when I wrote was that whenever I quoted Scripture I had to give the reference. You even told me exactly how to do it. I put the parenthesis here and the period goes at the end of the parenthesis, not before. And so, you insisted that I always give the reference. The thing of it is, the writers of the Bible didn't have you to tell them to always give the reference. Dennis Pollock: We can read huge chunks of prophecy in the New Testament that go directly back to the Old Testament. In fact, Revelation is just full of Old Testament prophecies. Dr. Reagan: There are over 300, and not one is directly quoted. Hebrews keep saying something like "it says somewhere, it says somewhere." Dennis Pollock: Right! Matthew will at least give the author. He maybe won't give chapter and verse because there were none in those days, but he will at least give you the author. But, in Revelation, they don't. And so, the New Testament prophecies are based on the foundation of the Old Testament prophecies. If you throw them out or never read or study them, you are definitely going to be at a loss for really understanding the whole picture. Gary Fisher: I'm no stranger to this question, because I was raised in a denomination that taught that the Old Testament was fulfilled and so therefore it is no longer relevant. The New Testament is the only relevant book. As a matter of fact, when we'd go to the book stores to buy a book we would buy only a New Testament. We wouldn't even buy the Old Testament. Dr. Reagan: Yes, I grew up in the same kind of church. If the preacher said, "Bring your Bible," we all brought our New Testament. Gary Fisher: I'm with Dennis. The Old Testament illuminates the New. One of the classic examples I can come up with is Romans 11:25, "a partial hardening has happened to Israel until the fullness of the Gentiles has come in and then Israel will be saved." Is there something in the Old Testament that gives us more illumination of that? Yes, there is, "the day they look on Him whom they have pierced and they mourn for Him as one who mourns for an only son." But, you have to have the two verses together for them to really start to fall together. Dr. Reagan: One connection that pops into my mind is that there is just no way in the world to understand Daniel and Revelation apart from each other. They fit together like a hand and a glove. You've got to know Daniel to understand Revelation. So, people really need to get into the Old Testament if they are going to understand Bible prophecy. In the next part of this series covering prophecy questions, our panel will reveal what the key is to understanding Bible prophecy. Please remember DrNofogs wife in prayer; she has been admitted to hospital and he isn't getting much sleep as things stand. Hope you all had a grand time over Thanksgiving - such a nice idea!